1. A prime number, according to worldwide consensus, is a number greater than 1 that is divisible only by itself and by 1. That excludes 1 as a prime number. But truth does not depend on human decisions: Whether 1 IS prime or not, is a logical and an ontological problem. In fact, according to Wikipedia-information 1 could be found in lists of prime numbers until 1956. It is to be considered whether the current definition of prime numbers has the right logic on its side. 2. 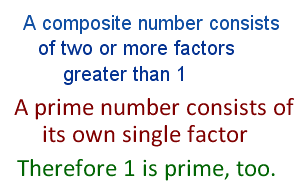 The reason generally forwarded for the exclusion of number 1 from the class of prime numbers is that the factors of composite numbers would not be written unequivocally as 2*3 for example, but also as 1(n)*2*3. So what happens is that in order to make the definition of prime numbers as simple as possible, number 1 must quit the field. In fact, according to the prevailing definitions, there aren't just two, but three groups of numbers: "composite, prime, and the unit 1". This makes things complicated again. 3. What seems necessary is a CHANGE OF PERSPECTIVE: the priority of definition should not lie with the prime numbers, but the composite numbers. A composite number is to be understood as a particular positions in a multiplication series, starting with number 1: Any individual number is to be defined as an individual, for example, 5 and it's 1*5. If it is doubled and trebled, it's 2*5 = 10 and 3*5 = 15. The first factor of the multiplication series is called MULTIPLIER, the second MULTIPLICAND. So 10 would be the second successive result in multiplying 5. The multiplicator 1 is IMMANENT to the initial multiplicand number and so need not be placed in front of it. The basic number 1 itself can be multiplier as well as multiplicand. As a multiplier it occurs only once, and a multiplicand it is a constant in successive groups of ones: 1*1, 2*1, 3*1. As to number 1 the application of both multiplier and multiplicand constitutes a SQUARE 1*1, and equal progression of multipliers and multiplicands creates more squares: 2*2, 3*3 etc. A composite number consists of two or more factors greater than 1 within an imaginal series of multiplication, for example 3*5 from preceding 2*5 or 3*4. Its result 15 can start another series of multiplication with multiplicands greater than 1. A prime number does not contain two or more factors greater than 1. It is the beginning of a multiplication series (1)*PN, 2*PN etc. The new definition eliminates the aspect of division as unessential. 6:7 numbers bring about an inversive relation of 7:6. Without 1 no relation would be possible. The numeric sums (NS) + factoral sums (FS) of the 6 CN and 7 PN are equally 84. The NS+FS of the first 9 (4-9, 1-7) and the last 4 (10-13) numbers are 84 (48+36; 36+48) again. The total of numbers within the decimal system proves to be a network of innumerable relations, which would seriously be impaired without 1 understood as prime number. The 13 numbers are placed subsequently from top to bottom. The inner and outer circle are in ratio 1:3. 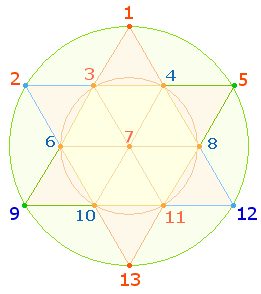 There are composite numbers (blue) and prime numbers (orange) both on the 6 extension points and the 7 hexagonal points. It has to be examined what ORDER there exists between the two classes of numbers. The sum 42 of the 6 extension numbers is the same as the 7 prime numbers between 1 and 13, and vice versa the 7 hexagonal numbers agree with the sum 49 of the 6 composite numbers.